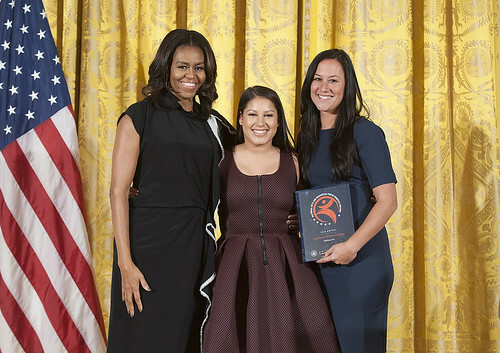 DREAM student, Valeria Cruz and Director of CityDance DREAM, Kelli Quinn with First Lady Michelle Obama. Photo by Steven E. Purcell. In May, we spoke withÂ Alexandra Nowakowski, Executive Director of CityDance, about the importance of education through dance. After The National Arts and Humanities Youth Program Awards, held on November 17, 2015 at The White House, we Â know that the President’s Committee on the Arts and the Humanities agrees that CityDance, and more specifically, the DREAM program, leads students on a path of increased academic success. The after-school dance program was recognized alongside programs teaching digital media, music, photography, writing, musical theater, and more, for “increasing academic achievement, graduation rates and college enrollment by engaging children and youth in the arts and humanities.” As one of 12 recipients of the National Arts and Humanities Youth Program Award, CityDance will receive $10,000 and a year of communications and capacity-building support from the President’s Committee on the Arts and the Humanities. Before the award ceremony that featured First Lady Michelle Obama beginning to dance behind the podiumÂ at the first mention of CityDance, we spoke with CityDance DREAM student Valeria Cruz and Director of CityDance DREAM, Kelli Quinn about everything related to dancing and dreams. Pamela’s Punch: Please share a brief educational/career background, and how you got involved with DREAM. Valeria Cruz: Iâ€™m a senior at Phelps ACE High School and have been involved with DREAM since elementary school. I joined the after school program because it allowed me to do what I l really love to do-dance and perform. Kelli Quinn: My initial introduction to CityDance was through a class I took there myself-a modern class that they had. I later found out about the open positions, and I started working with CityDance in 2008. I came into the organization as a Program Manager for one community site as a trial for the summer. That fall I moved into the DREAM management position. DREAM students. Photo by Barbara L. Salisbury. PP:Â What do you enjoy most about being a part of DREAM? VC: In addition to dancing and performing, I enjoy discovering new things about myself, and building my confidence. I also enjoy the environment, the community, and the support system that we have, where I receive help in every type of way, not just in dance, but in my personal life as well. KQ: Dance is something that I am really passionate about. Itâ€™s something that has really had an effect on my life, and I love that I am able to be involved with an organization that is able to have a similarÂ effect on young people, providing programming to young people in communities that otherwise wouldn’t have access to arts programming, and specifically dance. Dance is a really unique art form in that it really addresses the emotional, physical, cognitive, and social needs of an individual, and that is a really powerful thing. To be able to take that into the communities that we take them into is a wonderful opportunity for me as a person, but also for all of the students that we serve. I do think that weâ€™re really having an impact and that is something that I value. PP: What is the greatest thing you have learned through DREAM? VC: Iâ€™ve learned two major things. I learned how to become a leader, and how to communicate better. I mentor and assist the teacher in class by leading warm ups and helping her with choreography, and I communicate with the younger students, the adults, and my peers, applying these skills at school and at home. KQ: Iâ€™ve learned that dance is a really powerful tool that can really impact the lives of so many people in a really wonderful way. I already knew through personal experience how powerful dance could be in my life, but seeing that transformation and impact on other young peopleâ€™s lives is something that Iâ€™ve had a whole new experience learning about. Dance has an effect. You can take a shy student and give them confidence, you can make a child that doesnâ€™t feel like they belong feel connected, and it can take someone who already has leadership skills and help them grow in those abilities. It can also have an effect where students who didn’t want to attend school or didn’t have a connection with their school really want to go to school for what they get to participate in after school. Iâ€™ve also learned, because of the way weâ€™ve grown as an organization, and as a program, weâ€™ve really grown so organically, and Iâ€™ve learned that itâ€™s okay to listen and to be responsive. Our students were impacted by our program and their participation in dance, but through that, through their growth as individuals, they wanted more and had more needs, and they were looking for CityDance to provide those needs. We as adults, and as an organization, can really work to meet those needs. We have the ability to listen to our students and their families and really hear what they want. To be able to grow in that way, and find more resources, has really been an amazing journey for me, both for my career and for me as an individual. DREAM student Valeria Cruz. Photo by Barbara L. Salisbury. PP: Why do you dance? VC: I dance because it makes me feel like I can be myself and I can perform in any way that Iâ€™m feeling that day. If Iâ€™m sad, mad, happy, angry, I can use that in the dance room, or I can even choose to leave it all at the door when I get there and not worry about that. I dance because it builds my confidence and I like to shine. KQ: There are so many connections I have with Valeriaâ€™s answer, but there are also so many different reasons why I dance. What Iâ€™ve found in dance is that it really is a way for me to express my emotions as well, and for me to really kind of connect with myself and feel free in that. I was also really kind of a shy child-I didnâ€™t like the limelight, and so dance gave me the confidence that I didnâ€™t know I had in myself. It gave me a space to really explore what that was, and in a space that I felt safe in, to explore what it feels like to be confident, or to really own who I was. I actually use my voice in a much stronger way now, and the authority that I feel like I have as a person., if dance wasnâ€™t part of my life, I donâ€™t know that I would necessarily feel that. VC: Dancing at the halftime at the Wizards game, here at the Verizon Center. It was a very great experience. Iâ€™ve done it for eight years now, and every time I do it I get the same butterflies in my stomach. Even though Iâ€™ve done it so many times, I still get so excited to do it. So many people looking at you-and I get to dance with so many kids that work so hard for it. Itâ€™s a great experience. KQ: I had taken dance class a lot when I was younger, from about the age of four. At the age of twelve was when dance shifted a bit for me, and it became much more personal. What I attribute to that moment is the time we had an exercise where we were supposed to improv. Usually in dance classes you are given choreography, and you repeat after the teacher, and you get your body to do what it is being asked to do. That format is actually something that connected with me as a person, you know, repeat after me. I like knowing my boundaries, I like knowing the rules, and following those rules. But when I was asked to improv it kind of set me into this other place where there are no lines, there are no boundaries, and you are just supposed to move however you feel like you are supposed to move. I remember feeling so uncomfortable in that moment, and then I kind of pushed passed a wall. On the other side of that was a freedom that I hadnâ€™t really experienced, and also a connection to a part of myself that I don’t think I had ever tapped in to. That is when dance really started to shift for me as a person, what it was to my life and what it could be, and what it is now. DREAM student Valeria Cruz. Photo by Maggie Picard. VC: : Hip-hop-itâ€™s a fun way to dance, itâ€™s what Iâ€™m strong at, and I like the music and the way your body moves. KQ: Modern contemporary. I feel like itâ€™s something that my body connected better with in terms of what it requires you to do and what the genre is asking of your body. I think because I was stronger in that area it just naturally became something I was more successful in, and so it has become my favorite. PP: What is the last dream you remember having? KQ: I was at a wedding for one of my really close friends. Actually, sheâ€™s also on our teaching faculty, and I was at her wedding. Because of that, a lot of our DREAM staff were at the wedding, her family was there, and it was just a very celebratory dream. I remember little things, like the dress I was wearing, and the other people that were there, and a little bit of the ceremony, and I mostly just remember the fun that everyone had afterwards. I also clearly remember the emotion that my friend was going through during the whole process-itâ€™s something that stood out. PP: What is your dream? VC: My dream is to keep on dancing, and keep on performing. KQ: My dream sounds very cliche, but I personally struggle with the disparity that exists in our world, so I have very utopian dreams of people supporting each other, and people uniting, and being proud of our differences, and celebrating each otherâ€™s differences. I think that those dreams have increased now that I am a mom. I want those things for my kids, and I definitely think that dream has largely impacted the career that I have chosen for myself, wanting to fight for that for others. I think the best place to start solving all those problems is by looking to young people, to our kids. When they are young there are so many choices that are made for them, so if we kind of focus our attention on doing whatâ€™s best for young people, and giving them the support they need and the resources they need, it can really shift how we all operate together and with each other. In my dreams we really do live in a perfect world, and everyone is skipping through daises holding hands. PP: What are your long term goals? VC: I am currently applying for colleges to major in communications and minor in performing arts/dance, or vice versa. The DREAM program is mentoring me throughout the entire process. KQ: Itâ€™s exciting to talk about this now because weâ€™re embarking on really reaching our dreams at this moment. In three years weâ€™ll be moving into our own home in downtown DC with state of the art dance studios, with academic service rooms, office space, and a black box theater. The space will enable us to triple our student population, and it will also allow us to deepen and expand the services we can offer. What weâ€™ll be offering to 375 students is world class dance training and access to working with professional artists and dance companies, in state of the art facilities. Weâ€™ll be offering full academic services and family services on-site to all of our students, and that is a dream that we have been really striving for, that we realized a few years ago and have been working toward ever since. This year we are embarking upon a three year transition space to really enter into that dream and the reality of that dream. Itâ€™s really exciting.